Shalom all ye readers! Hanukkah was a whole month ago but I’m still reeling over latkes in February (is that strange?). Throwback to when I made these last December. No, we don’t still have a Christmas tree up in February, that’s madness. 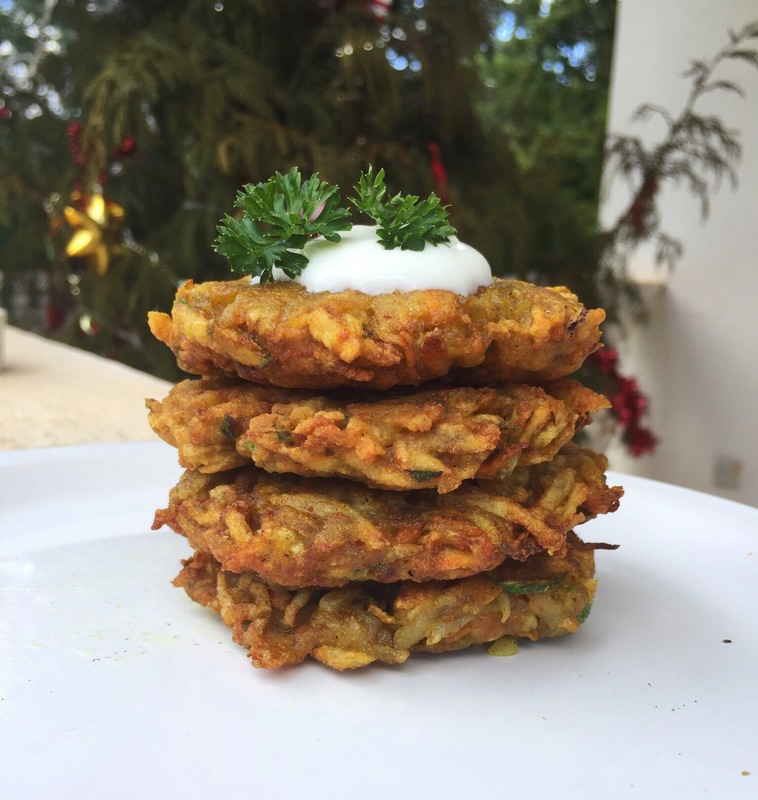 This week, I’ve decided to pay homage to the Jewish people in my life with these curry vegetable and potato latkes. My first attempt at latkes was in March last year and it was an absolute disaster. They were thick (and hadn’t cooked in the middle), rubbery and had 0 flavour whatsoever. At that moment, I put down my spatula, retired to my bedroom and decided that that was that. 2 weeks later, I tried a different aspect of Jewish culture and managed to produce a perfect loaf of Challah Bread. Score. 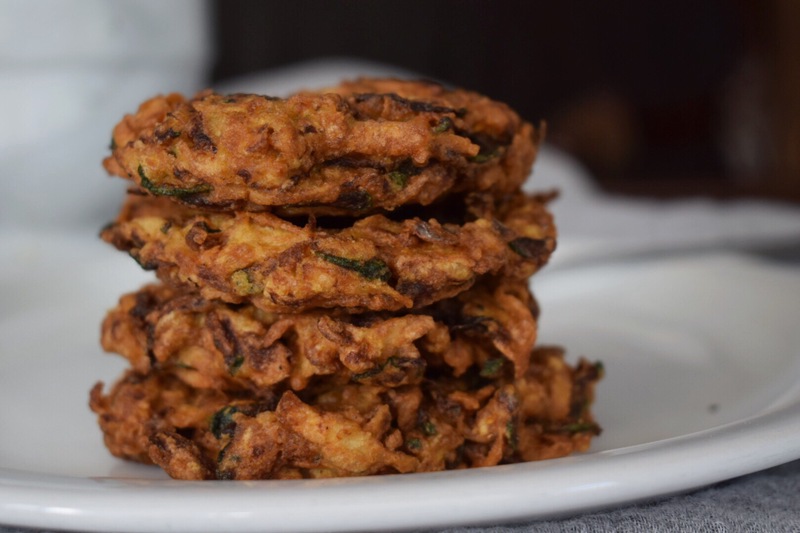 Last December, I decided to put away my sissy pants and give latkes another try. And my god were they UH-MAZING. Top it with a soft fried egg and you will be in breakfast heaven. In 2017, I’m pledging to give up less, and learn to give things another try. 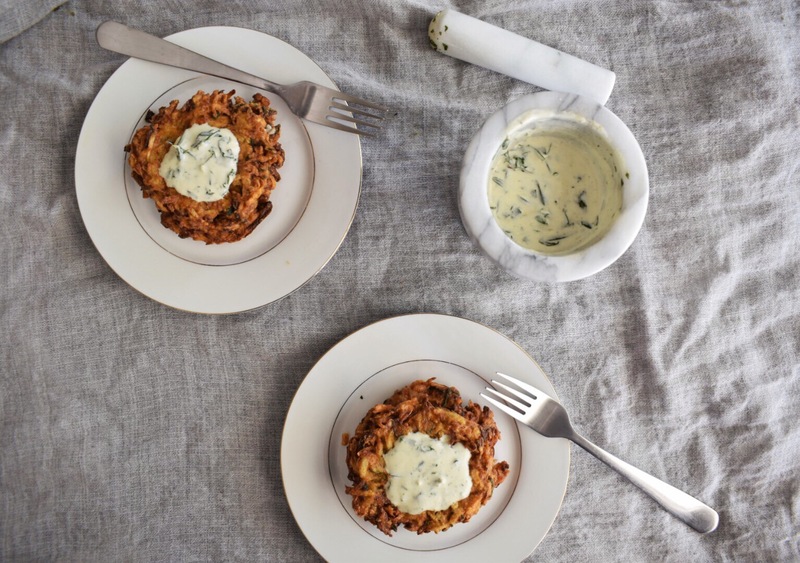 In the spirit of trying new things, give these latkes a go! Add the garlic, mint, rosemary and olive oil to a mortar and pestle and crush. If you don’t have a mortar and pestle then you can just chop the herbs and garlic finely. Add the herbs to the sour cream and stir. Let sit at room temperature and infuse whilst you prepare the latkes. Grate the potato through the larger divisions of a cheese grater. Transfer the peeled potato to the centre of the cheesecloth. Wrap the potatoes tightly in the cheesecloth and squeeze as much moisture out of the potato as you can. I got about a cup worth of water. Remove the potato to a large bowl and discard the cheesecloth. Grate the carrot, onion and baby marrows and transfer to the second piece of cheesecloth**. Try to squeeze as much moisture as possible out of the vegetables (I got ½ cup worth) before transferring to the same bowl as the potatoes. Toss the mixture together with your hands to evenly distribute the vegetables. Add in the flour and spices and toss until the vegetables are completely coated in the spices. Crack the egg into the bowl and use a fork to work the egg into the dry mix. Stop mixing when the veggies are coated in egg. Wet your hands with water and grab a handful of batter and shape into a flat pancake. If the mixture won’t hold together because it’s too wet, add 2 tbsp of flour and try again. Try to make them as flat as possible. Repeat until you’ve used up all the batter. In a deep saucepan, heat the oil to 350°F. Shallow fry the latkes in batches, for 2-4 minutes on each side or until deep golden brown on the outside. 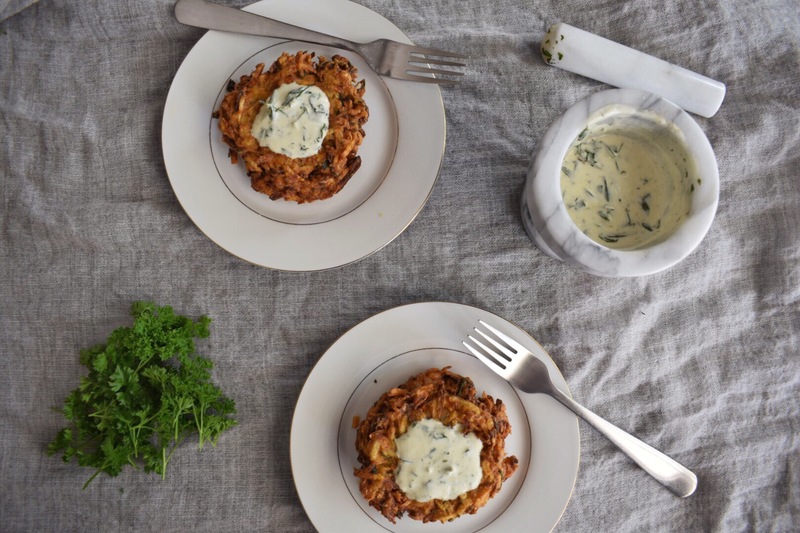 Serve immediately with the herbed yogurt and consider adding a fried egg on top! **I know that you are secretly thinking about squeezing the potatoes and the vegetables together in the same piece of cheesecloth because Andrea is totally crazy if she thinks that I’m honestly going to waste 2 whole pieces of cheesecloth! I’m not your mum, you don’t have to listen to me, do what you want. I tried this and it was difficult to get a piece of cheesecloth large enough to fit everything. It was also more difficult to squeeze water out because of the bulk of the vegetables. But hey, you can go your own way if you wish.